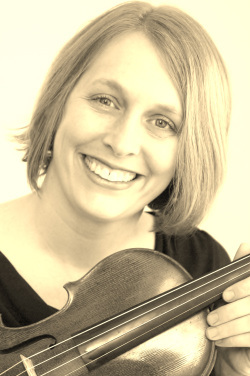 Violinist Jennifer Leckie is a member of the Elgin Symphony Orchestra, the Maverick Ensemble, and the Illinois Philharmonic Orchestra. A former member of the Amabile String Quartet, Iris String Quartet and the Society for Chromatic Art, she has also performed with the Milwaukee Symphony, the Lake Forest Symphony, Chicago Sinfonietta, Ars Viva, ModernWorks, the Composers Forum, and Music Under Construction. Third Prize winner of the Crane New Music Festival Solo Competition, and winner of the Rutgers University Award for Excellence in Performance and Scholarly Writing, Ms. Leckie was also a finalist in the Alliance Chamber Music Festival Competition and a semifinalist at the Fischoff Chamber Music Competition. Ms. Leckie has performed many world and U.S. premieres and has worked closely with composers Charles Wuorinen, Lukas Foss, George Crumb, and Ornette Coleman. She has performed as soloist with the Elgin Symphony and the College of DuPage Symphony. Ms. Leckie holds a doctor of musical arts degree from Rutgers University where she studied with Arnold Steinhardt. She obtained bachelors and masters degrees from the Mannes College of Music while working with Todd Phillips, Ani Kavafian and Sally Thomas. Ms. Leckie teaches privately at Downers Grove North and South High Schools. 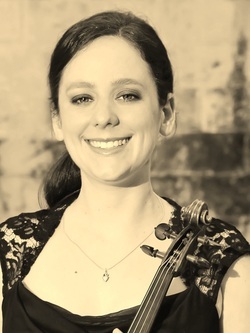 Violinist Caroline Slack, originally from Vashon Island, Washington, has established a performance career as an active chamber and orchestral musician in the Chicago area. Caroline is a member of the Illinois Philharmonic, Des Moines Metro Opera and the Britt Festival Orchestra and performs frequently with the Elgin Symphony, Ars Viva Orchestra and the Chicago Philharmonic. As an avid chamber musician, Caroline performs with the Grant Street String Quartet. Caroline received her Bachelor of Music degree from Oberlin Conservatory of Music and her Masters degree at the University of Texas at Austin studying with Brian Lewis. She has also performed regularly with the Kansas City Symphony, San Antonio Symphony, Victoria Bach Festival and was a founding member of the Quartus Chamber Players in Houston. Timothy Archbold was raised in Regional Australia in the small town of Castlemaine, Central Victoria. He graduated from the Castlemaine Secondary College in 1998 having studied with Anna Daniel and Megon Smithies, and he received a Bachelor of Music Performance with Honours from the University of Melbourne in 2002 under the guidence of Nelson Cooke and Phillip Green. He was a teacher of strings and assistant conductor of the orchestra at Girton Grammar school in Bendigo, Victoria 1999-2003. Timothy has been a principal cellist of the, Australian National Music Camp Orchestra, the Melbourne Youth Orchestra, the Geminiani Orchestra (Melbourne), the Melbourne University Orchestra, the Victorian College of the Arts Orchestra, the Bremen Hochschule Orchestra, the Launders Bremen Jungen Orchestra; and has played with Australian Youth Orchestra, the Oldenburg City Orchestra in Germany, Orchestra Victoria, and has participated in professional development with Melbourne and Sydney Symphony Orchestras. His ensemble work includes performing with the Orenda Ensemble; he also is a founding member of the Berkeley Ensemble, both based in Melbourne. 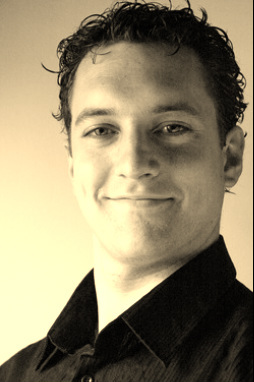 Timothy has appeared as soloist with several Victorian groups, performed many solo recitals throughout Victoria, and won numerous awards and Eisteddfods. In December 2007, Timothy completed his studies at the Hochschule für Künste in Bremen, Germany where he studied with Professor Alexander Baillie. During his time in Germany, Timothy also studied at the Hannover Hochschule for Music and Theater under Hatto Beyele and the Karol Szymanowski Quartet studying Chamber music with the Aquila Quartet. He has recently completed his Masters Degree at Wichita State University, playing with the Bloomfield String Quartet and the Wichita Symphony Orchestra and moved to the Chicago area where he is teaching and free-lancing with several orchestras and is assistant principal of the Peoria Symphony Orchestra. He is on the teaching faculty at Bradley University, Peoria. Tim and his wife Karen play and perform together in the Archbold Duo.